It’s summer, and when the temperatures rise, so does our appetite for burgers. On our last date, we found what could be the best burger in Atlanta at H+F Burger in the Ponce City Market. 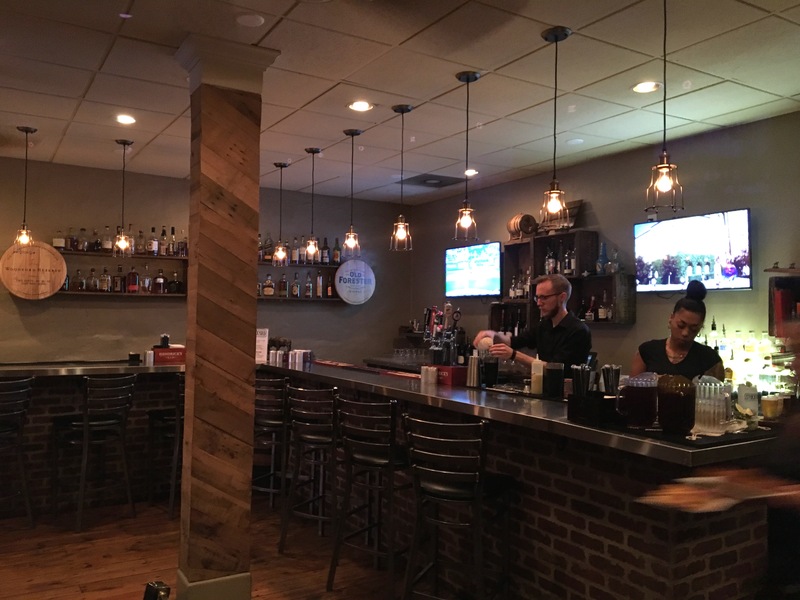 Tonight, we go on a double date as we hit the square in Marietta for burgers and beer at Stockyard Burgers and Bones. We tried to eat here on a Friday night a few weeks ago, but it was so crowded that we had to go down the street to Sugar Cakes Bakery for dinner. We are joined on tonight’s date (on a Tuesday) by “Indian Hills Bill” and his lovely wife Stephanie. 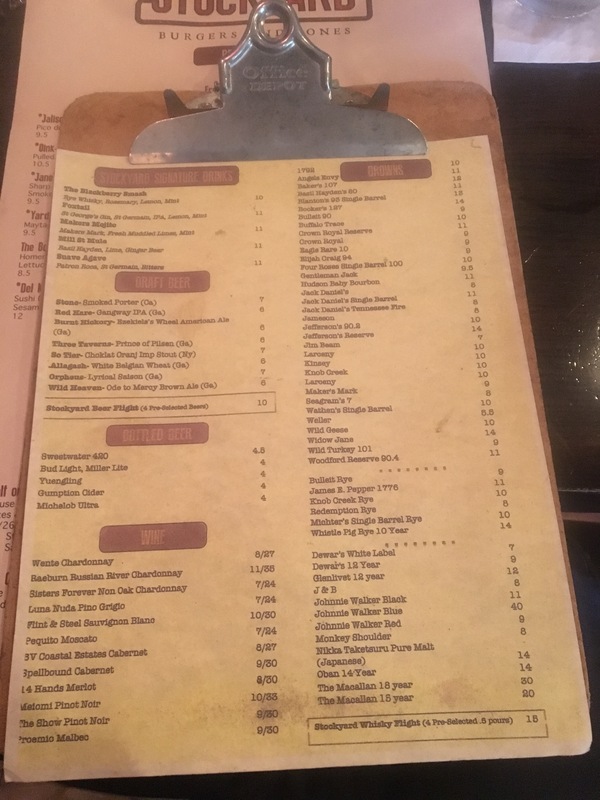 Our assignment was to come up with a burger and beer place near our houses. Let’s see how we did. 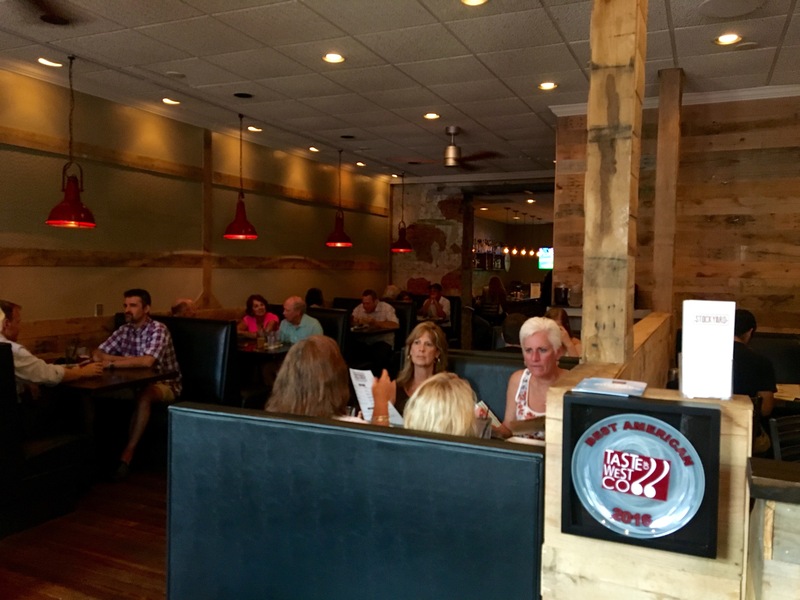 The interior is designed, believe it or not, with a stockyard theme. There’s lots of wood and chicken wire on the walls. There’s a bar in the back where all the cool kids sit. Or at least maybe they are students from Life College tonight. We start out with beer. There are eight drafts, mostly local. Don’t bother with the bottled offerings unless you buy your beer at truck stops. We both go for Allagash White, which we forget to photograph. The menu says it’s from Georgia, but we all know that it’s from Maine. It’s a nice, Belgian single that is easy to drink during hot weather. Since we are on a double date, we get to sample more food tonight. Like two appetizers from the “table feeds” portion of the menu. Lamb testicles are on this list, but somehow nobody orders them. Our companions order the onion rings. I wonder if these are Vidalia onions. (They should be!) The circular root of the onion bulb is served almost tempura-style. The batter is very light, and although I usually stay clear of onions, these are quite tasty. Here’s a dish called “Stockyard Tots”. 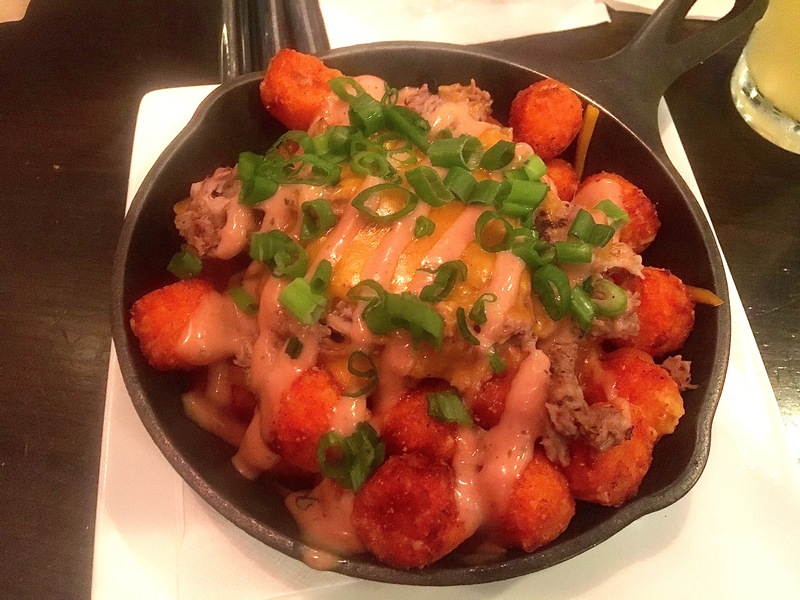 Sweet potato tots are smothered in pulled pork and cheese. We’ll give some points for creativity, but not for execution. The pork is better than the tots, which should have been crispier. It’s time for the main event, the burgers. You can also order off of the “bones” part of the menu and get ribs, but we’ll have to save those for our next visit. We both get meat on a bun, which we probably could have split because, although it’s a single patty, this is a big burger. Tempted as I am by the Dirty South burger (mac and cheese and bacon), my cholesterol level can only handle a Kitchen Sink burger. There’s bacon, fried egg, chili and cheese on this burger. It really has everything but the kitchen sink. They had me at fried egg. This is messy and enjoyable. You do get to pick your sides. 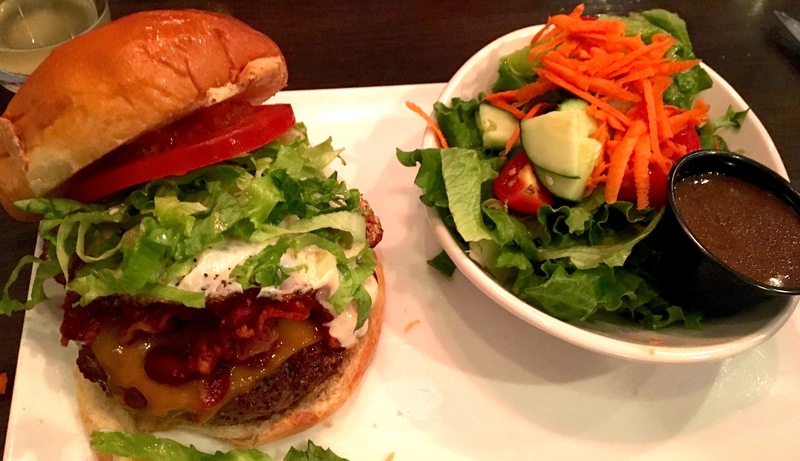 I balance the burger with a basic side salad instead of the hand-cut fries. You have to make your sacrifices somewhere. There’s two ways to order your certified Angus beef: pink, and not pink. Eve gets her Jane’s Not So Plain burger (yes, they have cute names for all of the burgers on the menu) pink. Isn’t this one pretty? Eve instantly notices that these are Holeman and Finch buns, a fact confirmed by our server. Betwixt the H+F bun is cheese, lettuce, tomato, and homemade pickles. It’s much healthier than my burger. It comes the correct color of pink. The ingredients are fresh, and she dubs this burger “dee-licious”. We do not take a picture of Bill’s Yard Burger because he leaves off the arugula and bacon jam, which basically leaves a patty covered in bleu cheese. It wasn’t very photogenic. Stephanie is the healthy one tonight. She tops those onion rings off with a Cobber Salad. 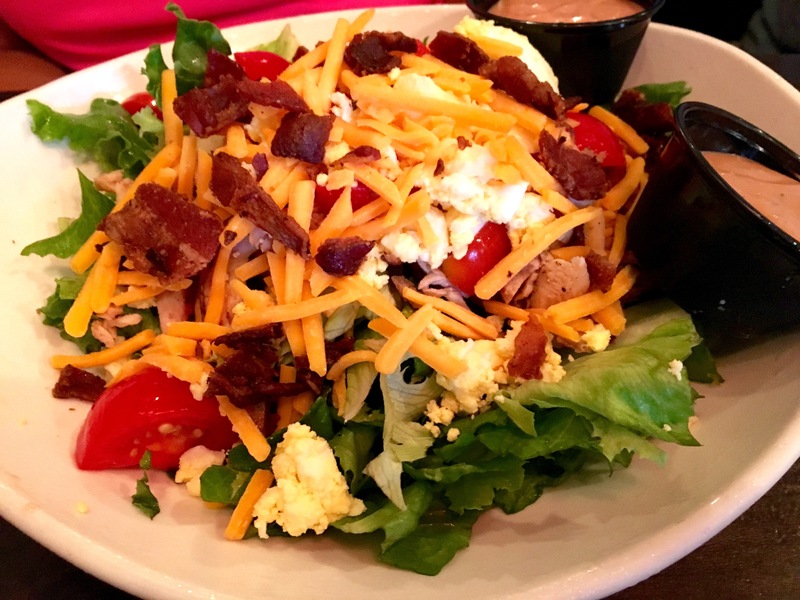 It has the usual ingredients for a Cobb salad: chicken, bacon, cheddar cheese and eggs. 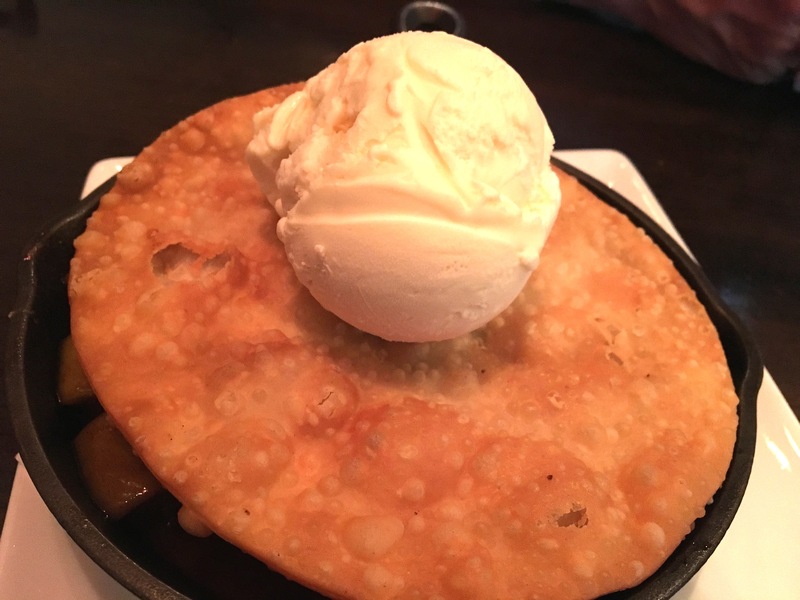 We really don’t have room for dessert, but if you share one four ways, it has no calories. Or so we would like to believe. 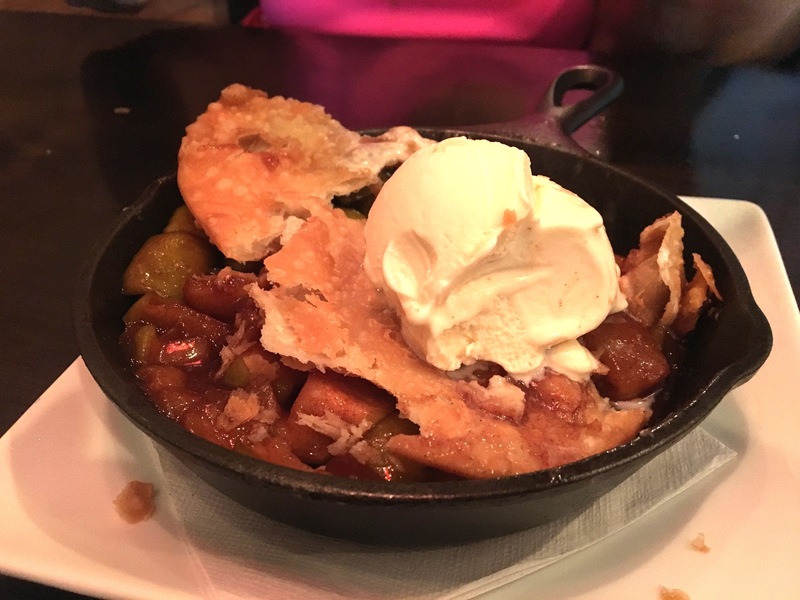 Peaches are in season, and we order the peach-apple cobbler. You get to the cinnamon-soaked fruit. If you don’t like cinnamon, you should skip this dish because there is a lot of the national product of Sri Lanka inside. Did you know that 80% of the world’s cinnamon comes from Sri Lanka? Stick with us, and you will soon know everything. 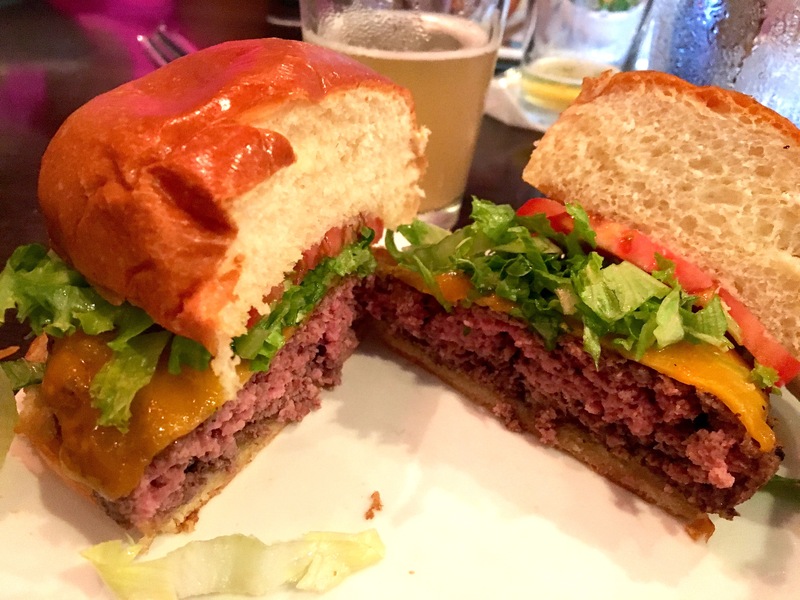 The bottom line on Stockyard Burgers and Bones: Is this the best burger in Marietta? No. Right now, we give that honor to the Gobbler at Moxie Burger. However, this is the best burger on the Marietta Square, and if you are dining out at “May-retta Central”, you should check it out. 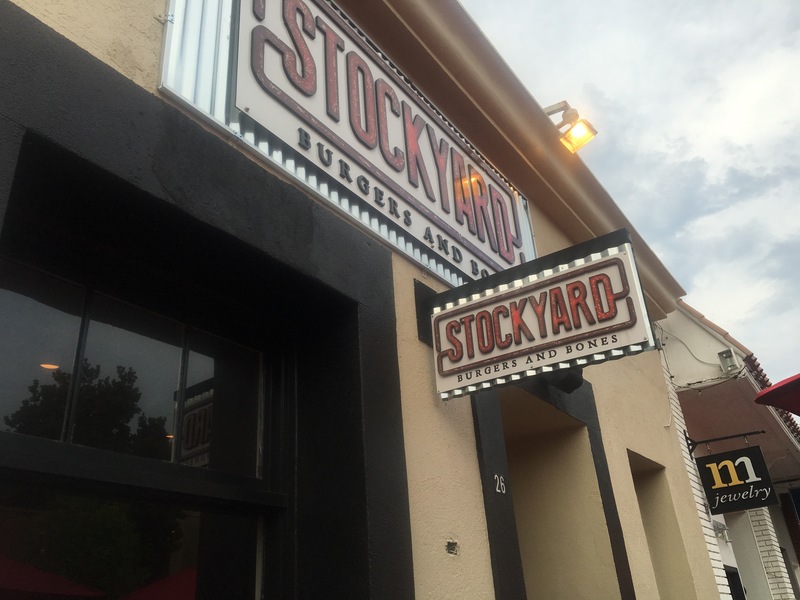 Good news for those of you in Vinings–Stockyard is opening soon in the old Noche space, and soon this may be the best burger in Vinings.